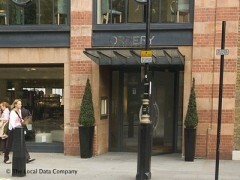 About: The Orrery is an elegant dining room situated on the first floor of the Conran Shop in Marylebone. It is light and airy with large arched windows which afford views across the parish church gardens. The menu has a strong French influence and offers a variety of classic dishes. There is a terrace bar on the third floor where drinks and light meals are available from the bar menu. Winner of the London Restaurant Awards 2000, Outstanding Front of House. The restaurant has a Michelin star. Fans of gourmet French dining will find Marylebone High Street’s Orrery has more than enough to please the discerning gluten-free diner; just advise them of your requirements and feast on stuffed pig’s trotter, foie gras and lobster. A Marylebone institution, Orrery’s Provençal theme extends to the look of the rooftop terrace, with its olive trees and fragrant lavender. Here you can have a meal from the a la carte menu or just pop up for a cigar and a cognac or two.